The transition from winter to spring is always a difficult one. How many layers do I wear? Is it raining…AGAIN? Wait…now it’s snowing? 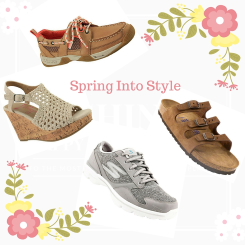 With Mother Nature being her humorous self, sometimes it is hard to pick the right outfit to wear on a spring day, but we have chosen some of our favorite shoes to help create some outfit combos and we wanted share them with you! 1. Skechers GoWalk 3 Motive Walking- Women’s- This casual style is perfect for taking a long walk in the park to running errands around town. You can effortlessly throw together a classy look by adding a baseball cap, your favorite pair of comfy jeans and an over-sized crew neck sweatshirt. Not only does this shoe embody style, but it also gives you an anatomically correct arch support to keep your feet pain-free through whatever activity you choose. If you're interested in this, the GoWalk from Skechers, click here to find a variety of different looks! 2. Birkenstock Florida Mocha Soft Slide Sandals- Women’s- Need a quick shoe to throw on but still look cute? This Birkenstock is the perfect shoe for a variety of occasions ranging from hiking your favorite trail to a beach day with your friends. Style this shoe with colorful khaki shorts and your favorite cardigan to add a preppy flare to a classic shoe. Definitely a lightweight shoe, so you won’t be held back from taking part in your warm weather adventures! 3. Jellypop Rita Sandals-Women’s- Step into style and comfort with these Rita Sandals. This shoe gives off a beachy vibe with the naturally woven upper and a 4 inch cork heel. This is the perfect backyard barbecue shoe when meeting up with old friends this summer! Pair with your favorite sun dress for an unforgettable look! 4. Sperry Sea Kite Boat Shoe-Women’s- Night on the town or a day on the boat? Why not rock a classic boat shoe! This shoe gives more of an athletic look compared to an original Sperry, but it still gives you comfort and keeps your feet dry. These shoes would look great with khakis, but don’t be afraid to try them out with more casual wear as well. We would consider pairing these shoes with black leggings and a jean shirt for a breezy, spring night. We would LOVE to hear from you about which spring shoe would fit you the best! What outfit do you usually pair with the shoes we chose? Not feeling any of the combinations? Check out our website for more styles and colors to find the perfect spring shoe for you!